Feeding penguins and getting up close and personal with these feathery rascals always been a dream with you? Well we’ve got just the thing. Most people think you have to go to the South Pole to find penguins – though actually you find them in quite a few places in the southern hemisphere, including the tip of South America and the south of Africa. But if you can’t afford the plane fare (and we don’t think Easyjet go to penguin places anyway), then here’s some good news. There are a few locations in the UK where you can mix and mingle with these gorgeous little chaps, get their lunch ready for them, and then get them eating out of your hand. Here are the cheapest penguin experience days in the UK right now! All prices are updated real time, so you see all the deals as they happen. And remember, if this doesn’t appeal to you because you’re a hard man and don’t cry at weepie movies, then imagine what a fantastic gift idea a penguin feeding experience would be for your GF, OH, significant other, daughter, son, mum, dad, auntie or gran – and you’ll find that if anybody loves penguins, then it’s your gran!. Where can I feed penguins? There are three animal parks that welcome you in to check out and feed their penguins. One is Drusillas Park in East Sussex, the second is Chester Zoo and the third is Paradise Park at Broxbourne in Hertfordshire, but that one is sometimes not available. So all of these fine places are well within your reach unless you live in the far North of the country – and even if you live in the far North, isn’t a penguin feeding experience worth a little bit of driving? Penguin feeding experience – what happens? All locations give you roughly the same experience. You’re welcomed to the park and given refreshments, then taken on a tour of the animal park and shown all the other fabulous animals. Then it’s an introduction to the little fellows – Humboldts and Rockhoppers in Sussex, Humboldts in Hertfordshire and Chester. I don’t know if you’ve got a preference in penguins, but we just love them all. You then pop behind the scenes to prepare their fishy meal, which means getting down and dirty with some fish, so you need to take your wellies and some old clothes, though you may get an overall to protect your clothes while this is going on. And then – wait for it!! – it’s into the penguin enclosure and it’s feeding time at the zoo. Just like in the picture above, they’re hungry little blighters and crowd round you to make sure they get their fair share of fishy treats. The keepers will help you all the way, show you how penguins like to be treated, and even take photos as mementos of your big penguin adventure. At the Hertfordshire experience, you even get a souvenir T shirt so you can show people exactly what a great time you’ve had. Just so you’re prepared, here’s what we found good about the day, and a few less good things to be aware of. 1. It’s got penguins! You get to sit among them and have the little fellows waddling all around, right up to you and taking food out of your hand. 3. The keepers are fantastic and very welcoming. They’re quite happy to take photos of you up to your neck in penguins, and they can tell you an awful lot about these little princes of the sea that you didn’t know. 1. It’s fishy. Whatever your protective clothing, you’re going to get a bit fishy. The penguins get right up close and personal with you, and they live off fish, so that says it all. We found it well worth getting a bit fishy for the privilege of mingling with these charmers, but you do need to be warned. 2. You get about half an hour with the penguins. We suppose this is fair enough, as they like to spend some time swimming and not being fed, but the half hour shot past like an arrow. And to be fair, an hour wouldn’t have been long enough either. But at least we got to spend the rest of the day, free of charge, checking out all the other furry and feathered people living in the park. Check out the experiences on the links above – the cheapest one doesn’t give you the T shirt – and click on the links for more detail. You can book online there and then if you want to. All the experience providers are on our panel of recommended suppliers, so they’ll all do a good, reliable job and you’ll be pleased with your day. The links above give up to the minute prices, and suppliers sometimes charge different prices, so you can go with with whoever is giving the best deal for the penguin experience you want. If you love penguins, but can’t stick the idea of getting fishy. Or you know your gran or mum would love penguins but is a bit iffy about fishiness, then Adopt a Penguin does make a great gift idea. You get all the penguiny stuff with none of the fish. And it’s a whole lot cheaper. 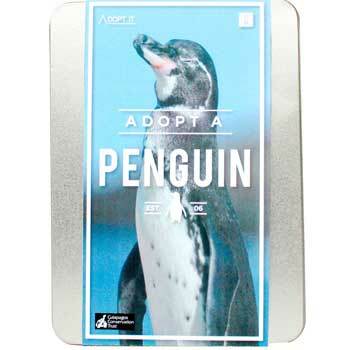 Here are the adopt a penguin gifts for you to check out. A. Because they can’t get the wrappers off!! Penguin feeding experiences4.33333333333Sarah FirminHow about feeding penguins on an animal experience day? Throw fish to the cheeky penguins and get up close and learn all about these fishy, feathery fellows. Enjoyed the Chester zoo feeding too, Penguins can’t fail to cheer you up. the fish we fed them was a bit grim. Stank of fish for days!!!!! 4 stars. Lost 1 for the stinky fishies!!!! You’ve got a point. Make sure you wear the gloves they provide or you’ll have fish fingers for weeks! 2 penguin reviews at once – is Britain going penguin-crazy? If you fancy something a bit warmer, try feeding red pandas. They’re like furry warm teddy bears. Just got back from Chester Zoo and what a fun day! Penguins galore and I stink of fish but it’s a once in a lifetime experience. Gives a whole new feeling to a zoo visit, when you’re treated like a VIP and get to go in with the penguins. 5 stars! That’s what we like to see, someone really enjoying an experience they wouldn’t normally have. And these Penguin days are really cheap considering you get free entry to the zoo too.